Mlxplore is an application for the visual and interactive exploration of your models. It is designed for intuitive and easy use. It is a powerful solution in your daily modeling work as well as for sharing and teaching of PK/PD principles or for real time dose-regimen exploration in front of an audience. Mlxplore also allows you to visualize the statistical components of the model, such as the impact of covariates and inter-individual variability. Mlxtran is used for custom-built model programming; a simple, yet powerful model language that is suitable for simple PK as well as complex Systems Pharmacology models, Mlxtran contains a set of macros and keywords for PK/PD models. Treatment and administration can be specified by Mlxtran. Mlxplore offers an easy-to-use, flexible and fully interactive interface. It includes an embedded text editor with auto-help and syntax highlighting for Mlxtran language and Mlxplore projects. Models are automatically compiled in the background for lightning fast simulation. Mlxplore not only has an efficient ODE solver, but it also supports delayed differential equations (DDE). Explore structural and statistical model properties. Prediction distribution and prediction intervals. You can construct your model in Mlxplore and use it in Monolix. But you can also estimate your parameters in Monolix and re-explore/improve your model based on Monolix results and the data set. What is the purpose of Mlxplore ? Mlxplore is a software for model pre-analysis, design and diagnosis, in order to build your model according to your data and the phenomena you would like to model. It is a powerful platform for creating human-readable model descriptions using the Mlxtran language, for the graphical exploration of your model, comparison with data, and for exploring the effect of individual parameters and covariate on your results. What is not the purpose of Mlxplore ? Mlxplore is not designed for advanced clinical trial simulation. For these tasks, please investigate Simulx, an advanced trial simulator integrated within the Monolix Suite. Mlxtran is used for custom-built models; a simple, yet powerful model language that is suitable for simple PK as well as complex Systems Pharmacology models. The model file containing the structural model, the observation model, the individual parameter definition and the covariate definition. A dedicated web site for the Mlxtran syntax is proposed . Mlxtran also contains a set of macros and libraries for PK/PD models. It is very helpful to quickly and intuitively define your model. Click to see more. To explore the model, it is necessary to add several things. One has to add the administration and treatments, the parameters, the variables of interest for the graphics, and optionally predefine some options for the graphics (names, order, …). A dedicated web site for Mlxplore documentation is proposed. 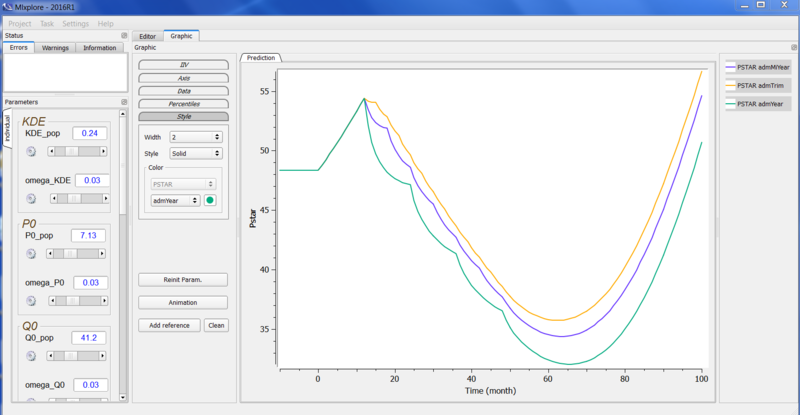 A graphical interface to see in real time your model results. All the defined parameters are configurable with sliders. The effect of a value change is immediately visible on the graphics which allows a nice interactivity. The graphics represents the outputs defined in your model and can be displayed in several forms (each output w.r.t. time, one output w.r.t. an other one, …). Moreover, there is the possibility to do a certain number of simulations representing the inter individual variability and/or covariates impact and represent it on the graphics. A dedicated web site for Mlxplore documentation is proposed.